A new sky bridge linking two Dubai hotels has been lifted into place, marking the city’s completion of yet another landmark engineering feat. The new 85-metre-long bridge is erected at a height of more than 220 metres and links the new Address Sky View hotel with the Address Residences Sky View in Downtown Dubai. But it’s much more than a bridge linking two buildings. The Sky Bridge, which is 22 metres high and 30 metres wide, has three stories and will be home to eight units of luxurious Sky Collection Duplexes, a 70-metre-long infinity swimming pool overlooking the Burj Khalifa and The Dubai Fountain, and other amenities. Billed as another iconic tourist attraction for Dubai, the Sky Bridge is fabricated using 4,500 tonnes of structural steel. A team of global experts from five different entities worked on the Emaar Properties project that was completed in around 365 days by more than 300 professionals and skilled workers. “Building and lifting the Sky Bridge is the result of the hard work and collaboration of some of the best international experts in the field, who addressed various challenges through their innovative and creative approach,” said Mohamed Alabbar, chairman of Emaar Properties. 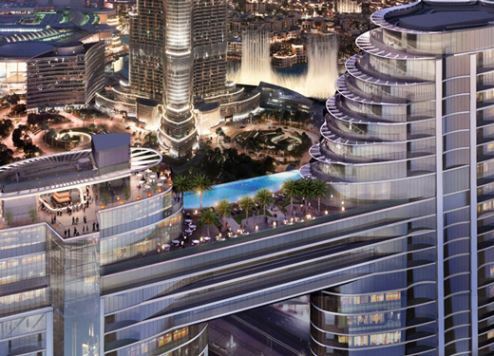 The Sky View complex will be linked to The Dubai Mall Metro station.